On Demand Digital Manufacturing by FATHOM is an online platform that provides users with quick and easy access to quotes and orders for prototyping and production parts. The FATHOM team utilizes the most advanced technologies, materials, and processes to help companies innovate new products better, faster, and more efficiently. Get a quote and place an order in just a few easy steps—register or login, upload files, and choose from a wide range of options! Watch this featured video to learn more about how to use our online quoting and ordering system. 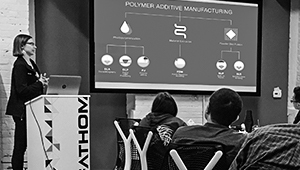 FATHOM experts have designed a variety of training programs focused on the practical use of technologies, materials, and processes —learn more about the next available training session + traditional manufacturing 101 seminars. FATHOM is changing the way products are designed, prototyped, and manufactured—faster speeds and greater innovation. Watch the video to learn more about FATHOM's dynamic advanced manufacturing solutions. © 2008-2018 // What Can You FATHOM? FATHOM is an advanced technology-driven manufacturer of prototypes and production parts with a unique advantage of agility—our experts help companies go from concept to prototype to manufacturing in ways not previously possible. Talk to FATHOM today about its digital manufacturing ecosystem of solutions. 3D Printing, Additive Manufacturing, CNC Machining, Urethane Casting, Tooling, Injection Molding, Engineering/Design, & Managed Equipment Services. Inspired to change the way products are designed, prototyped, and manufactured, FATHOM was founded in 2008 by Rich Stump and Michelle Mihevc.